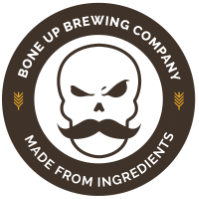 Stats: Come Out and Play - Bone Up Brewing Co.
Color (alternate): Orange, with a bright red center - like you'd get if you angered a tangerine. Cheese Pairing: That goopy orange "cheez" that comes out of a pump dispenser. Best Occasion to Drink: While watching The Warriors, duh. Brewers' Notes: As soon as she learned of Warrior's existence, Jimbo has been itchin' to use it in a single hop beer. And as luck would have it, this lil' hop fits in perfectly with our MO for single hop beers - it's largely flown under the radar (most brewers use it for bittering only) but it brings some cool flavors and aromas to the table - our "expert panel" (Jimbo and Jared drinking warm hydrometer samples) says it tastes like orange candy, but carries a strong spice-rack dried-herb aroma. Solid!